AP Language and Comp or AP Literature and Comp - analyzing syntax. 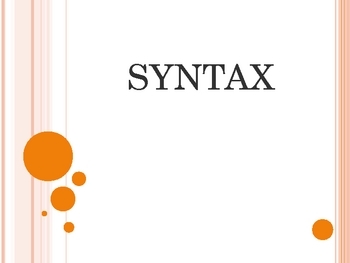 Power Point guides students through elements and techniques of syntax, then includes 6 passages for guided practice of syntax analysis. 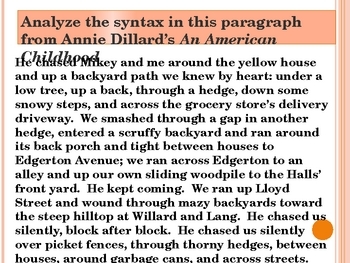 Passages are from Annie Dillard's An American Childhood, except for one from Tim O'Brien's The Things They Carried, and are all dense with clear and effective syntax techniques. 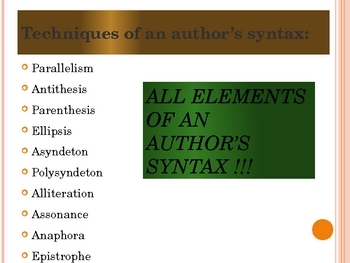 An answer key of sorts follows the excerpts with possible answers for the syntax analysis.